A new report on a major US geopolitical opponent reveals how disruptive technology can shift the balance of power in the Middle East. This comes from one of the UK’s leading think tanks, the International Institute of Strategic Studies (IISS), and their latest publication titled Gulf Security After 2020, which is available as a free download. Inside its 48 pages are several essays discussing aspects of Iran’s armed strength and the threat this poses to the region. Its contents were authored by subject matter experts who offer both context and insight on how Tehran’s hard power is changing. The meat of the report are seven separate essays that tackle Iran’s military capabilities. A very brief introduction explains how the 2015 Joint Comprehensive Plan of Action (JCPOA) that lifted economic sanctions succeeded in empowering Iran. The possible outcomes this can unleash are enumerated so that the Persian Gulf states who will be confronting Iran’s growing influence know what they’re up against. 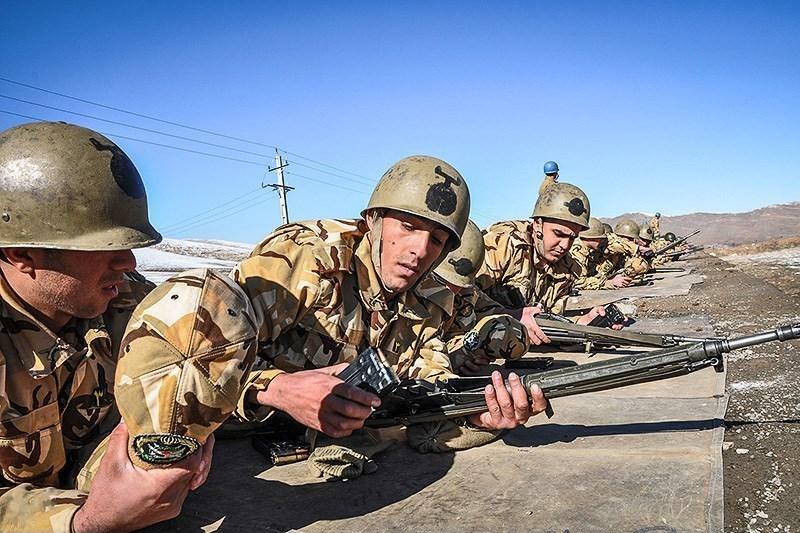 In The Strategic Foundation of Iran’s Military Doctrine (p.5), Matthew McInnis picks apart the myth of Iran’s armed strength, which looks impressive on paper but in reality leaves much to be desired. This stems from the intentional separation of the Artesh, the regular armed forces, from the political organization known as the Islamic Revolutionary Guard Corps or IRGC. McInnis notes that in the aftermath of JCPOA Tehran might attempt to rebuild its conventional arsenal and pivot away from “asymmetric” fighting. The next essay, Iran After Sanctions: Military Procurement and Force Structure Decisions (p.11), written by Michael Eisenstadt explains how Iran’s military evolved after the long war against Iraq. Lacking funds, it built up a missile arsenal for deterrence purposes and perfected irregular warfare techniques it’s now using in Iraq, Syria, and Yemen. But true modernization is elusive, Eisenstadt insists, because the costs of multinational arms deals are too high. This is painfully apparent in the lack of options for rebuilding the air force. Tehran compensates by stockpiling missiles, importing specific conventional weapon systems from Russia, exploring cyber capabilities, and further clandestine nuclear research. For Iranian Maritime Improvements: Challenges and Opportunities (p.17) the author John Miller explains in so many words how puny the regular navy is. One example he mentions is the construction of two frigates copied from existing British-made warships that dragged for 10 years. The real threat, however, is the Revolutionary Guard’s “guerilla” fleet that can disrupt commercial shipping in the Persian Gulf. Dire possibilities such as the acquisition of supersonic Yakhont anti-ship missiles must be anticipated. 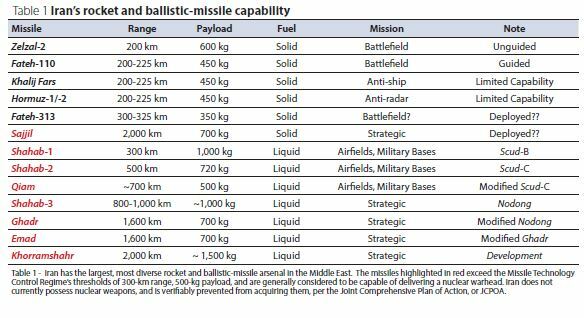 Iran’s missile and rocket arsenal, as tabulated on page 29. Douglas Barrie’s Iran and the Challenge of Combat Aircraft Recapitalization (p.23) takes after the previous essay and offers a frank assessment of another armed branch, the air force. Anyone familiar with the state of Iran’s air force, especially when compared to its neighbors, knows it flies dated US and Soviet airframes. Barrie doubts Iran can afford to rebuild its fleet with local designs and points to licensed production of either Chinese or Russian models as the only viable way forward. Iran’s Missile Priorities After The Nuclear Deal (p.27) by Michael Elleman is a welcome guide to the sinister ballistic stockpile controlled by the Revolutionary Guard. The author provides a great overview of Iran’s longstanding fetish for battlefield rockets and their larger cousins but as he correctly informs the reader, Iran’s missile arsenal is simultaneously inaccurate and questionable. Elleman explains how these serve as terror weapons foremost and their true effectiveness is still being tweaked. John Drennan’s Iranian Unmanned Systems (p.33) provides a superb account of the Islamic Republic’s alternate air force. Judging by the scale and variety of its drone production, Iran could be on par with Israel when it comes to deploying unmanned hardware. Drennan mentions how airstrikes, battlefield surveillance, and intelligence gathering via drone are well within Iran’s ability. On one occasion, an Iranian MALE drone flew above a US carrier and sent back live footage of its flight deck. The problem with Iran’s drone industry is its reliance on imported parts, e.g. avionics and engines, but should swarming technology be adopted this presents a grave threat to US forces in the Middle East. Analysts and researchers will find Gulf Security After 2020 a useful introduction to Iran’s multifaceted role as global adversary. Far from making bold claims, many of its salient points are in sync with ongoing trends impacting technology and warfare. As further incentive, the wealth of helpful trivia the authors share earns it a place in any serious reading list on Asia’s ongoing ferment.